There are currently 9 users and 1183 guests online. Finally ticked a wahoo off my bucketlist today. Took a soft grassy 93/lumo. Yep the hook was rigged with wire. The 200lb leader was heavily scuffed just above the crimp though so I don't think it would have held much longer. It looked amazing in the water all lit up with the blue stripes but lost most of that colour for the photo unfortunately. nice work Kyle how's the weather treating you? how long you up there for? It's been pretty average at best mate. Raining on and off since Saturday and the winds been up a bit but looks to be coming good about Thursday. I fly home next Monday so should get a few good days in. That's a big ticket item on my list too. Hoping to tick it off in Coral Bay at Christmas. Nice one mate; the hoo always seem to pose for pics really well too hey. The jaw always reminds me of a pair of tins snips when it's open like that! Wahoo is still on my list. 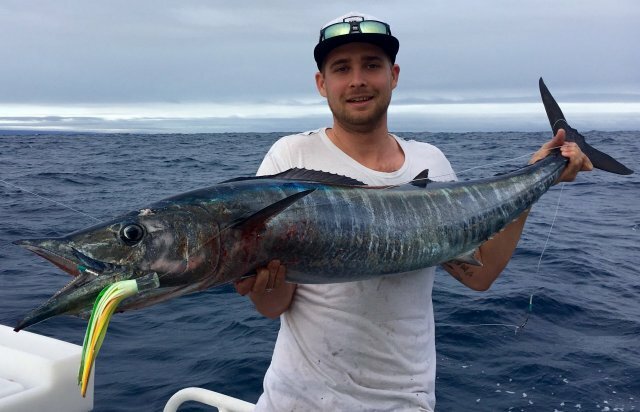 I caught all my wahoo on lumo Soft Grassy's this year, and lost two lures in the process. Same story as previous years. This was the only one we managed to land. Lost an oscar jr 502/506 and a UV/926 just after this on a suspected double hookup on much bigger wahoo. Became quite an expensive day.